Trying to balance healthy lunches and the grocery budget is much easier than you think if you eliminate the convenience. Having a picky eater in your house can certainly present some challenges when it comes to ensuring healthy lunches at school for your son or daughter. I swear my son has been a picky eater since the minute he was born so when it came time for him to go to school the thought of him not eating his lunch or not having enough to eat while at school had me worried. My son’s first year of school was a tricky one as it seemed that whatever I sent to school for lunch with him ended up coming home. Looking back on his first year I realized there was a lot of food waste and wasted money in our grocery budget. At this point I was not only concerned about him not eating enough but this also made me realize that I needed to change my approach to cut down on money being thrown away. Pizza day is by far still my favourite day of the month, it’s the one day every month I do not have to make a lunch. My son loves pizza and as much as I love not having to make a lunch. Pizza is one of those foods that is a treat for him and it’s not something that he can have everyday if I am going to ensure he is eating healthy lunches while at school. Meal planning and making a grocery list are two tools used by many to ensure they are getting the most for their money while eating healthy, affordable meals from day to day. I have started to include my kids in this process, I am not the only one who eats the food so why should I get to make all the choices? While still offering healthy choices, giving the kids the power to choose some of what they will eat has made getting them to eat it a lot easier. The little reminder that ‘hey you chose this’ seems to help, being involved in the decision making process is exciting for him. While letting your child choose what they eat you need still need to be the parent and make sure they are making good, healthy choices. Let your child pick multiple foods from a custom list that you have provided and find ways to work those foods into your grocery list each week before heading out to the grocery store. You will soon see that making lunches day after day will start to become a less daunting task knowing that you have food on hand your child will eat. While some people believe that a child should eat what is put in front of them, I believe giving them the power to choose makes for happier, healthier stress free meals for all three of us in our home. Too much salt is not good for anyone. 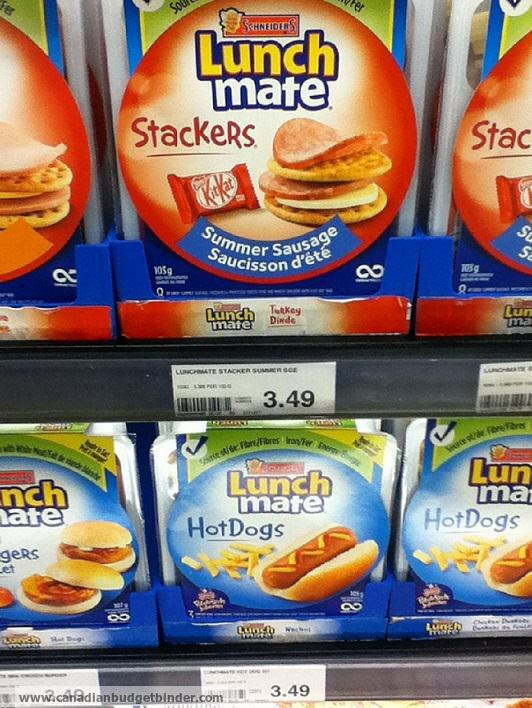 Sure buying pre-made products like Schneider’s Lunchables are great because they cover it all, you get meat, cheese and crackers or mini-pizzas that are lots of fun for the kids to make. The lunchmate convenience lunch even come with a treat of some kind usually a mini chocolate bar and even now a fruit cup. While Lunchables are certainly convenient the sodium content in one of those packages is unreal almost 2/3 if not more of my son’s recommended daily intake and too expensive. 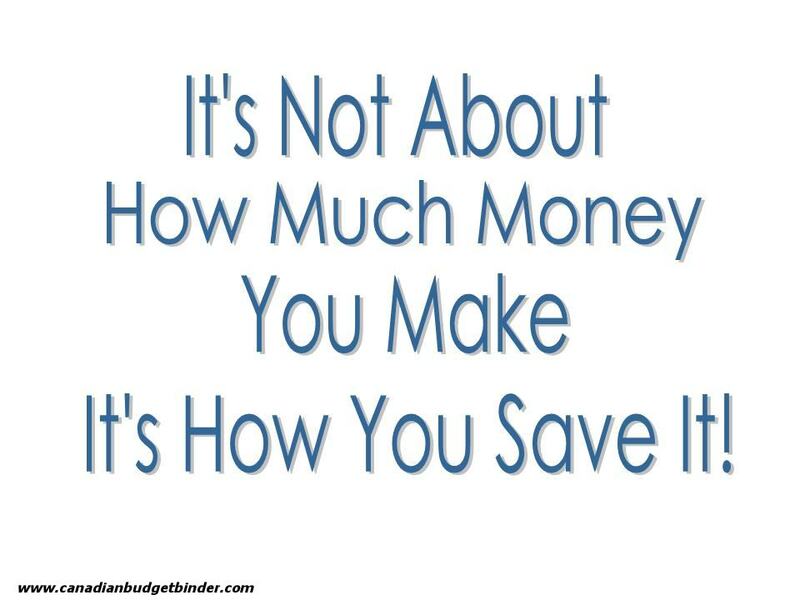 With lunchables ringing in at a cost of approximately $3.49 that is too much to pay for something with that much salt and simply not feasible for the grocery budget! You can make a homemade lunchable for far cheaper than $3.49 even if you get the lunchable on sale for dollar days I still wouldn’t buy them. Salt is only used for baking in our house, I don’t even own a salt shaker as there is enough salt in everything these days. Making your kid’s lunch at night makes for a less stressful morning but I will admit it just doesn’t always happen. While it is easy to throw in processed, packaged snacks from the pantry we all know that they are not always the healthiest or cheapest option. 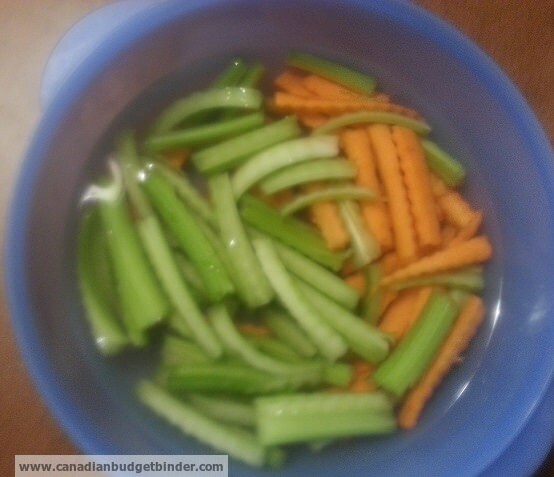 I like to keep some cut up celery and carrots in a container in the fridge so it is always readily available to my kids for a quick snack. The best part is that it only takes a second to grab a few and throw them in a container for lunch instead of scrambling around to find something to go along side with his sandwich, wrap or whatever else he chooses to have for lunch that day. I also enjoy baking and make muffins, cookies and quick breads like pumpkin bread and zucchini bread quite often. I’m sure my kids are not the only ones who get bored eating the same things over and over again, even I get bored easily with food sometimes. One way to combat this food boredom is by making sure I have a variety of food options on hand. What this does is it also eliminates those words of ‘not again’ coming from out of their mouths and more food going in! It makes me a happy mother knowing my kids are happy. Baking a few different recipes and freezing them gives him a variety of things to choose from and avoids me hearing those dreaded words. Keep in mind when freezing that you want easy access to these frozen snacks. 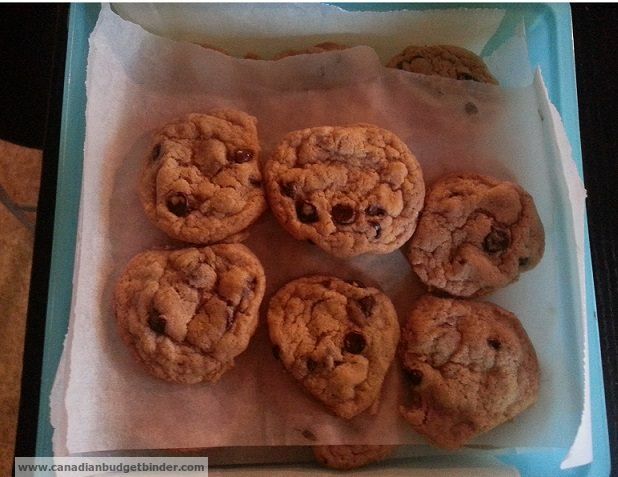 When freezing cookies I like to put them in a container with layers of wax paper in between so the cookies do not freeze together , I can then easily grab one or two out to add in his lunch and by lunch time they have thawed in his lunch bag. I also cut up my loaves of pumpkin and zucchini bread prior to freezing, also layering wax paper in between, so I do not have to thaw a whole loaf at a time to send a slice as a yummy, homemade snack to school. I like to eat to most of my food warm but my son could care less if his sausages or baked fish fillets are cold. When planning our meals for dinners throughout the week we like to include some foods which he can take any leftovers for lunch the next day. 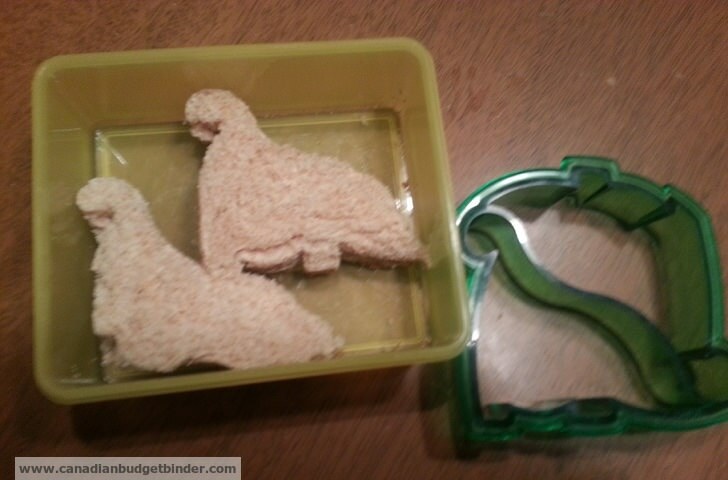 Cutting my son’s sandwiches into dinosaurs makes for a fun lunchtime, making him want to eat them. I often add in a post-it note with a smiley face or a ‘hope you’re having a good day’ as it adds a positive to start to him sitting down to eat his lunch, making him excited to eat what’s in his lunch bag. I am lucky that both of my kids when given a choice will 99.9% of the time choose water to drink over anything else. Making juice from frozen concentrate and putting it in a reusable bottle is not only cheaper than buying juice boxes but along with using containers versus Ziploc bags for sandwiches and other snacks, it cuts down on the amount of garbage you send with your child to school. Though we do have some juice boxes in the cupboard to drink up, my son rarely chooses to take one and is more than happy with just his water bottle, a much healthier choice and better for his teeth. Once the juice boxes are gone we will not stock up again. Even with having my son involved in planning our meals involving him in the daily choices of what he is going to eat that particular day by going over these choices every morning with him assures me that he is happy with what he has to eat that day. This process with my son promotes him to likely eat it his lunch and bring less food home which is what the aim is for or should be for any parent who wants their kids to eat a healthy lunch. We quickly go over what he has chosen to take in his lunch bag and which snack is for his morning snack and which snack is for his afternoon snack. This school year has been more successful with him eating healthier foods with less food coming home needing to be thrown out after sitting in his backpack all day. Ensuring my child was eating a healthy lunch every day was a battle I didn’t think I could win, though including my son’s lunches in my meal plan, a little creativity and some frequent food preparation has been the key in making this a success. My kids are young but some of these practices can be applied to older kids as well, at this point though they may be able to make their own lunch taking some of the stress off you. A teenager may be a little upset with you if you sent a dinosaur sandwich to school but having things prepared and healthy yet fun options to choose from will make making their own healthy lunches easier for them as well. How do you ensure your kids are eating healthy lunches while at school without breaking your grocery budget? PF Weekly Grab a brew #41: Can you survive without a cell phone for just one night? At my kids school, no peanut butter allowed. And also no oranges or anything containing oranges. I would love to make PB&J every day but can’t. I find that meat sandwiches on white bread are disgusting when they are warm. And the kids don’t have a place to eat with a table so anything requiring utensils (soup, chili, etc) is out too. I seldom buy processed foods for my daughter especially junk foods. I’m just happy that she really loves fish and vegetables aside from pork. Thanks for this great tips Katrina! Great article as usual Katrina!! I had to make a lunch for years for hubby while he worked a straight midnight shift. He got what ever we had for supper that night in a plastic dish he could microwave in the cafeteria at work. With the two older kids, they took a lunch the first few years and then off and on over the rest of the time. The younger boy didn’t take a lunch until high school as he went tot the next town for that. I always asked the kids what kind of sandwich they wanted so I could be fairly sure they would eat it. Thankfully I didn’t have to deal with the current problems with peanut butter as the older boy would only take peanut butter sandwiches!! He’s still like that…. The closest he came to variety was the jam in there. I always had baking to go in too. In grade school I paid for the milk orders for them. With the younger boy in high school he came with me to pick out what he wanted in the way of a cold meat for his sandwiches and his juice for the container. As his Dad took pudding in his lunch so dod the younger boy. One pack of instant pudding per night split two ways. I used plastic containers for everything and he had a plastic spoon that came home every night to be washed as well. I made both his and his Dad’s lunch at night as hubby needed his for the late shift and it was just easier to make both at the same time, two lunches…one mess. Our daughter is running the lunch detail now and after a few issues the first week things have settled down. The little mr is in a different classroom now. They had to add a class thanks to the numbers, so he was moved. He loves his new teacher!!! His lunch is made the night before as they have to leave quite early. He does have a say in what goes in as she takes him with her shopping and they have always talked about what they are getting and if it is healthy and such. He loves fresh fruit and veggies so that’s good. He takes after his uncle in that he loves his PB but now he knows he can only have it on the weekends!! NIce tips Katrina! Reading this post reminded me of when my two children were younger and we made lunches for them. My daughter was and still is a very picky eater and it was difficult to find things she would eat for lunch. We finally had some success with leftovers from dinners. 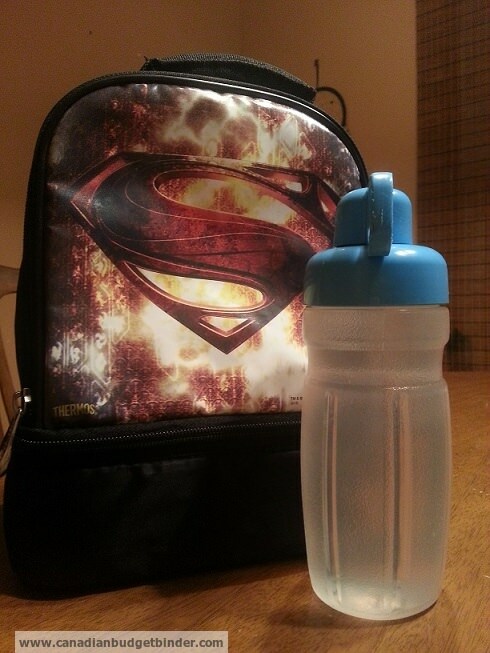 By involving the kids in the meal planning, dinner time and lunches go so much smoother! Good post Katrina! Thankfully it’s not an issue we’ve had to deal with yet, but we’ve had our fair share of picky kids. They didn’t start out that way, but have moved more so that way. We’ve found that involving them in the meal planning and gardening has been a major help for us to eat different things. Amazing isn’t it how kids love something one day, hate it the next and then love it again a week later!